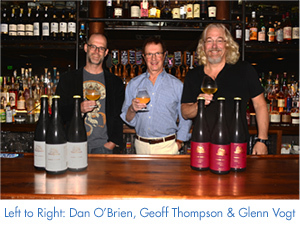 New York’s Thompson’s Cider Mill formally launched its artisanal hard ciders at a special kick-off tasting at RiverMarket Bar and Kitchen in Tarrytown, NY, the first restaurant to offer the hard ciders on tap and in bottles. The launch, which took place on June 13, coincided with Cider Week Hudson Valley. At the gathering, Thompson’s Hard Ciders were paired with farm-to-table fare prepared by RiverMarket. The dry and semi-dry ciders are crafted in Westchester, NY, from heirloom and specialty apples from the Cider Mill’s own orchard as well as other Hudson Valley orchards with whom Thompson has long-time relationships. The fresh juice is pressed and fermented in small batches at the Cider Mill founded 42 years ago in southwest Yorktown near Croton-on-Hudson. The key to moving forward came when he aligned with Dan O’Brien, a trained cider maker. A food scientist, he had worked with PepsiCo before exiting the corporate world to work in the California wine industry for four and a half years. He then moved with his family back to New York and began trying his hand with home cider making. O’Brien’s Yorktown Heights home was only 10 minutes from Thompson’s Mill, and he had recognized the quality of the fresh cider Thompson produced. He began filling 5-gallon glass carboys of the raw juice to ferment into hard cider at home. And as tends to happen at the Cider Mill, which is open weekends from September to Christmas, Thompson and O’Brien got chatting about their mutual interest in hard cider. So, it wasn’t surprising that when Thompson decided to make a formal move into hard cider production, O’Brien was the first person he called. 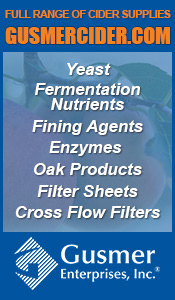 For more information on Thompson’s Cider Mill or to visit them, check out their website at ThompsonsCiderMill.com. Photos provided by Thompson’s Cider Mill. Bold Rock Hard Cider announced the release of their newest seasonal style, Blackberry Cider. Available on shelves this month, Blackberry Cider is a fruit-forward blend featuring a tart, semi-dry finish. Bold Rock features 12 styles of hard cider, including the popular originals, Apple and Draft, a rotating mix of seasonal selections, and IPA (India Pressed Apple), a top-selling hopped cider. These innovative varieties of cider have found favor with a wide range of customers and critical acclaim throughout the industry, as Bold Rock has won over 100 awards in hard cider and wine competitions since first launching. Blackberry Cider will be available on shelves throughout Bold Rock’s distribution footprint, which includes 10 states between Eastern Pennsylvania and Georgia. 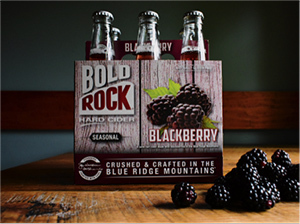 To find Bold Rock’s Blackberry Cider, visit them online at BoldRock.com. Photos courtesy of Bold Rock Hard Cider. 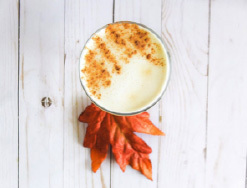 Tea was used as an ingredient in alcoholic punches as far back as the early 1700s; and although tea has been sipped hot in America since the colonial days, non-alcoholic tea wasn’t widely consumed on ice until the turn of the 19th century. It is believed that prohibition and the increasing availability of home refrigeration (with freezers) in the 1920s and ‘30s – not to mention the greater affordability of tea itself –propelled iced tea to its popularity today. This month, for National Iced Tea Month, enjoy tea like the generations before you…with alcohol! You’ll find all these five ‘tea’ ciders just as refreshing as a glass of iced tea on a warm summer’s day by the pool or at the beach. You can even get fancy and garnish some of these ciders with a lemon slice! Outlaw Cider Company’s Tea-Rex is a semi-dry cider made with Gunpowder green tea, earl grey tea and wildflower honey. This cider is crisp and refreshing, perfect for relaxing on your porch after a long day! Photo courtesy of Outlaw Cider. Noble Hard Cider’s Spice Merchant is made with freshly brewed AppalaChai chai tea. 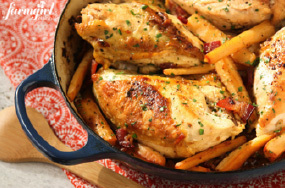 It is packed with loads of spice aromas, such as cinnamon, cardamom, clove and anise. This cider is semi-sweet with astringent tea finish, almost like breakfast in a can! Inspired by summers down on the Jersey shore, Summer Cider is a blend of the cidery’s popular Ironbound Hard Cider with iced tea and fresh-squeezed lemons. Summer Cider has a bright apple flavor, a hint of black tea and a citrus finish made perfectly for sipping during any of your favorite summer pastimes. Photo courtesy of Jersey City Works. Apple Pomer is the newest edition to the Red Apple Bombshell portfolio that is part of the War Horse Brewing Company brand owned by Three Brothers Winery. Apple Pomer is an infusion of Bombshell hard apple cider and lemon iced tea. This combination creates an incredibly refreshing and easy to drink cider. Serve this cider on ice and garnish with a lemon for the best experience. Photo courtesy of Three Brothers Winery. Toadally Tea is a blend of three apples with tea leaves, which creates a light and refreshing hard cider that is semi-dry and has medium sweetness. This smooth cider emulates an Arnold Palmer and will keep you cool and refreshed. Photo courtesy of Blue Toad Hard Cider. Anyday Rosé, a new brand offering premium rosé beverages perfect for anyone on any occasion, introduced its flagship canned rosé cider in celebration of National Rosé Day this month. The rosé cider is available for purchase now online via the brand’s website and Venmo, making it the first wine brand on the market to accept transactions using the social payment’s platform. 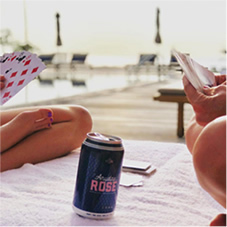 Anyday Rosé enters the rapidly growing single-serve canned wine market engendering male and female customers alike to enjoy products traditionally tailored predominantly to women. Founders behind the brand include former NFL player Pat McAfee of the Indianapolis Colts, Louis Roberts of Barstool Sports, and expert winemakers Andrew Jones of Tin City Cider and Michael Zinke of Zinke Wines. Upon realizing a mutual affinity for the crisp, dry taste of a quality rosé blend, the team decided to create a new alternative accessible to a wider, gender-neutral audience. While the company is based in New York, its rosé is crafted in the heart of the central coast wine region in Paso Robles, CA. Anyday combines a blend of 85 percent crisp cider and 15 percent rosé wine with hops, containing an alcohol content of 6.9 percent. The 375 milliliter cans, designed to match the flexible lifestyle of its customers, are available in packs of 8, 24, 96 and 365 (one for each day of the year) retailing at $32, $84, $312 and $1200, respectively. The Anyday team plans to launch additional canned wine products later this year and will also consider expanding into retail distribution in the near future. The canned rosé cider is available now on AnydayRose.com. Photos courtesy of Anyday Rosé. America spoke. Strongbow listened. Strongbow Hard Ciders is bringing back Original Dry after more than 100,000 loyal fans from across the US cried out on social media, call centers and snail mail that they could no longer find their favorite dry cider from the UK. That means starting this month, people can once again find Strongbow Original Dry at retailers and on tap nationwide. Original Dry is produced by H.P Bulmer, a cider company with over 130 years of British lineage and a coveted Royal Warrant. With less residual sugars than other brands, Original Dry is the ultimate expression of a dry cider made with a blend of bittersweet apples that are grown exclusively in Strongbow's own orchards in the UK. "Dry is the number one cider in cider's biggest market – the UK – and has always been a favorite with die-hard cider fans here – but what we're seeing now is more people opening up to drier, more balanced flavors," said Paul van der Aar, Master Brewer and Director of Quality and NPI Management at Heineken USA. "In addition to sweeter flavors, people are craving a wider range of options – from sweet to dry which is why Strongbow Hard Ciders is continuing to evolve and expand their range of flavors to meet the demands of the ever-evolving American palate." Sales of 'semi-sweet' and 'dry' ciders grew double digits last year according to Nielsen. Strongbow Rosé Apple, which has 50% less sugar than the other leading hard ciders, just received a top award at the 2018 World Cider Championships due to its delicate natural balance between semi-dry, slightly sweet and tart. Original Dry returns to a lineup of Strongbow flavors including Gold Apple, Artisanal Blend, Cherry Blossom and Rosé Apple. Original Dry has 5% ABV and is available nationally in both 16.9oz single serve and 4-pack 16.9oz cans. To learn more or find Strongbow Original Dry near you, visit the product locator at Strongbow.com, and follow Strongbow on Instagram and Facebook. Cirque d’Schilling is a cider carnival coming to town on Saturday, June 23, from 2pm-6pm at Schilling Cider House to celebrate not only Oregon Cider Week but Schilling’s one year anniversary. This adult only carnival will have 10+ cider vendors with more than 25 different ciders for you to taste. Tickets are $25 in advance ($30 at the door) and get you a pint glass and five tasting tickets good for one drink each. While enjoying ciders, you can take part in numerous activities including a dunk tank, ring toss, henna tattoos, face painting, and much more! Click here to purchase your tickets in advance. The Oregon Cider Week 5K Fun Run will take place on Sunday, June 24, at 11am at Portland Cider Co.’s Clackamas location. Portland Cider Co. is partnering up with the Oregon Brewery Running Series for a cider 5k, where participants walk, jog, or run approximately 3.1 miles, then drink cider. Everyone is invited to enjoy the day’s entertainment: live music, great food –– including BBQ from the owners of Portland Cider Co. –– giveaways and activities with partners and sponsors. Everyone receives a craft cider, and collector pint glass or seasonal swag item. Ten percent of proceeds help support the Oregon Brewshed Alliance, Dollar For Portland, and Life Vest Inside. Registration is limited. General participation is $30 but there are options that include t-shirts, if desired. Click here to register. Photo below courtesy of Portland Cider Co. Enjoy the History & Science of Cider in an educational class featuring cider tastings from across the world, including those true to the modern northwest cider craft. The class will take place on Monday, June 25 from 7pm to 9pm at Cider Riot! 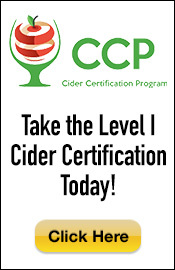 and offer an in-depth look at the history, process, and modern interpretation of cider. Limited to 36 guests, this is intended to be a personal, intimate gathering for cider lovers Oregon-wide. Early bird tickets are currently on sale for $25. Click here to purchase your tickets. The 2Towns Cider Curious Comedy Showdown is being held on Tuesday, June 26, at 7:30pm. 2Towns Cider is presenting a competitive improv showdown, where talented players from the Curious Comedy Theater combine audience suggestions with their own sharp wit and duke it out in an event that’s dubbed “The Hunger Games of Comedy.” Tickets are $30 in advance and $35 at the door. Click here to purchase tickets. The OMSI After Dark: Ciderfest is taking place on Wednesday, June 27, from 7:00pm-11:00pm at the Oregon Museum of Science and Industry (OMSI). The latest installment in OMSI’s After Dark series wades through the history, tradition and science that goes into the cider making process. While enjoying cider, you’ll also be able to enjoy the museum learning about robots, tornadoes, fossils and more. Tickets start at $15 but vary by option. Click here to see options and buy tickets. The 8th Annual Cider Summit PDX will take place Friday, June 29 and Saturday, June 30, at the Fields Neighborhood Park in the Pearl. This year's Cider Summit will feature over 150 regional and international ciders, cider cocktails and apple spirits. The event is Oregon Cider Week’s largest event and finishes out the celebrations of the week. VIP tickets include a souvenir tasting glass, 16 tasting tickets, and exclusive entry on Friday from 2pm-3pm for $40. General admission tickets include a souvenir tasting glass and 12 tasting tickets for $30 if purchased online prior to the event ($35 at the door). Additional tasting tickets can be purchased at the event for $2 each, as well as designated driver tickets for $5, which include a bottle of water. 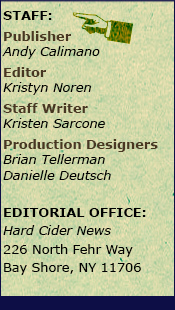 Additional information can be found on the Cider Summit Portland website. Click here to purchase tickets. 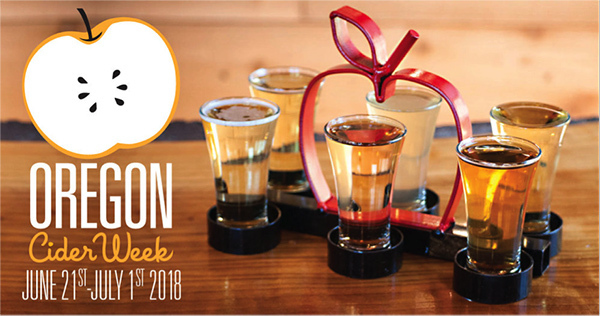 View the full list of Oregon Cider Week events at OregonCiderWeek.com.